If you are business looking to advertise and could write a wish list of what you want your print advertising medium to do, it might look something like this. Now this is not an exhaustive list but I am sure it covers some of the points you would want. So, does this medium actually exist? Yes – it’s called bus advertising! Whatever advertising you do and regardless of the message, there will always be a percentage of people who just don’t care. There will be a percentage of people who will only look on-line for everything…nothing else matters. But the biggest percentage of people by far are aware of the world around them. They do and will use digital, but only as and when their busy lives allow them to…….and this is where bus advertising, and other forms of so called traditional advertising, come into their own. Let’s take a typical working person and their daily routine. ….Get up and get ready to go to work. ….Leave the house at the same time every day and get in the car. ….Pass the same shop at the same time – you have to, if you don’t, you know you are going to be late for work! ….See the same people doing the same thing every day. ….You get stuck behind the same bus. ….You then see the same bus passing you going the other way. ….And see the same advert on the back or side of the bus every time! In fact, if you are following the bus, you will see the same advert for a long period of time. The average ‘dwell time’ is 48 seconds. So, let’s go back to our wish list written at the beginning of this piece. Great looking visual – If you use a good designer then, yes. Highly visible – If you are behind it you can’t help but see it! 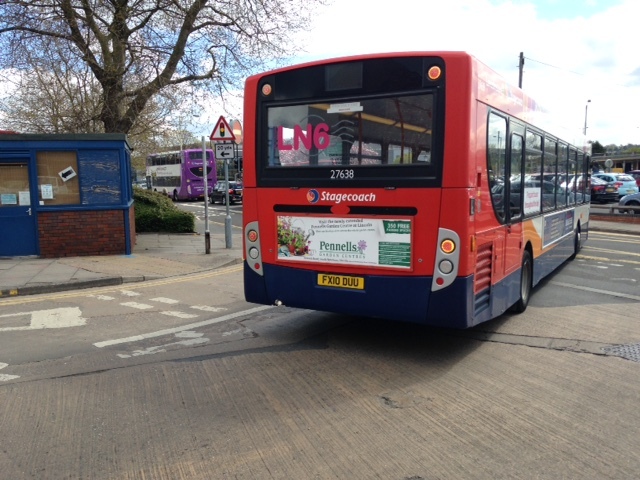 Regularly seen by a big percentage of the local population – If you are behind the bus everyday then so will others and they will see the advert. Regularly seen in geographic areas that are relevant to your business – The bus is in the same area as you and is promoting a company that is also in the same area as you! Great value for money – Yes – you will have to trust me on this….and you may be surprised as to just how cost-effective it is in comparison to other local media. So, with the answer to all of the questions being yes, as a business looking to get more from your advertising, bus advertising has to be something you want to know more about. If this is you, then give us a call at CG Advertising and we can go through all the benefits of this fantastic medium with you.